As was slightly reported last week on two of the Gizmodo Media blogs (thanks to Gizmodo and The Slot for reporting), US President-Elect Donald J. Trump talked with the New York Times and covered a lot of topics. During this interview he, in usual Trump style, made up a new wrong meme, pushed old wrong memes, and said non sequitur things. You know, you can make lots of cases for different views. I have a totally open mind. 1 Science generally works via a process in which evidence accumulates for a statement (a “view”, to use Trump’s wording) or a group of statements and/or evidence accumulates against a statement or group of statements. It is rather difficult to make “lots of cases” for “different views”, it is rather difficult to strongly support different hypotheses (“views”), because not all hypotheses have similar amounts of support. 2 Mr. Trump has shown very little interest in having a totally open mind on this issue but I guess here he’s just lying about his own brain and his public record. It’s a very complex subject. I’m not sure anybody is ever going to really know. Not understanding an issue completely is not the same as being completely lacking in understanding of it. 1 Weird misunderstanding that science is about “one side” v. another. 2 Geneva = The Climatic Research Unit (CRU) at the University of East Anglia; five years ago = seven years ago. Hackers stole data from the CRU, publicly shared thousands of private emails from climate scientists, and (just like this year!) conservatives constructed giant conspiracies where none existed. No one got fired or otherwise academically-punished for the CRUhack emails but I guess Trump is unaware of that. I’ve received so many environmental awards for the way I’ve done, you know. I’ve done a tremendous amount of work where I’ve received tremendous numbers. Sometimes I’ll say I’m actually an environmentalist and people will smile in some cases and other people that know me understand that’s true. Open mind. He’s apparently been saying this since at least 2011 and it seems to be just as wrong now as it was then. Whether humans are causing global warming has no connection to whether it will “cost our companies.” Scientific facts have no relation to economic opinions. You know the hottest day ever was in 1890-something, 98. The Washington Post’s weather bureau was glad to point out that this (really really non-specific) claim is not only non-specific but also wrong. John George Trump actually was a physics professor at MIT (for 37 years) but Donald Trump here doesn’t state what his uncle’s “feelings” on this subject were. 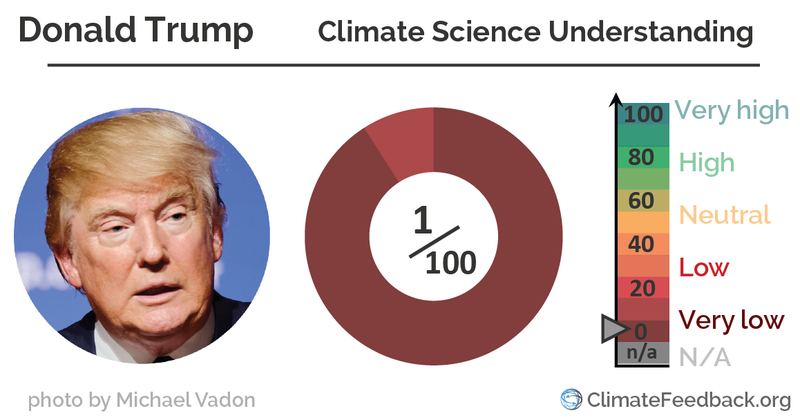 I guess Donald Trump here is stating that his uncle (who died in 1985) had feelings about climatology (IOW, not a field he was an expert in) and that’s more important than 31 years of additional evidence that humans are warming the planet? This guy who has no respect for or understanding of climate science continues to have no respect for or understanding of climate science. Oh right that’s not news that’s just the new reality.